Are you ending up more than just a few stray hairs when you run your fingers through your tresses? Are you concerned you’re losing more than the normal 100 to 150 strands a day in your hair brush or shower drain? Do you feel parts of your hair are thinning, leaving wider parts or even bald spots? The good news is, most hair losses don’t have to be permanent, and copper peptide can help. Also known as GHK-Cu, copper peptide is a powerfully protective and regenerative ingredient found naturally in our bodies that stimulates hair growth without the side effects of irritation or toxicity found in other hair loss treatments. Copper peptides are small tri-peptides made up of three amino acids: glycyl, histidyl and lysine. They bind to copper ions in your body to regulate metabolism of this trace mineral. Several enzymes rely on copper to catalyze biochemical reactions such as cellular renewal in the body. As a result of its regenerative properties, copper peptides can increase hair follicle size and reduce hair loss. Hair follicles may be damaged by an inflammatory auto-immune reaction or free radical reactions. An auto-immune inflammatory reaction happen when our own immune system produces antibodies and attacks the body by mistake, in this case the hair follicles. Copper peptides mitigate this by blocking the inflammatory actions of certain cytokines (molecules that aid cell communication in immune systems). Copper peptides also enhance the anti-oxidant ability of an enzyme called copper, zinc superoxide dismutase (SOD). This enzyme breaks down radicals that are dangerous to oxygen molecules (important in many biological processes). With copper peptide, SODs are much more effective. As we age, our hair follicles get smaller and experience less blood circulation. Strong hair growth needs a constant supply of minerals, amino acids and vitamins. With a reduction in circulation, fewer nutrients are delivered to the follicle. This produces thinner hair and eventually stops new hair growth. Over time, the fat layers surrounding the hair follicles also decrease. Skin lipid cells are associated with large, healthy hair follicles and provide nutritional support to the follicles. Copper peptides promote angiogenesis, the formation of new blood vessels, around the hair follicle. Greater blood flow of nutrients can increase the size of hair shafts and promote faster hair growth. Copper peptides are also responsible for decreasing a protein that activates cell death, slowing the rate of programmed cell death in hair follicles. 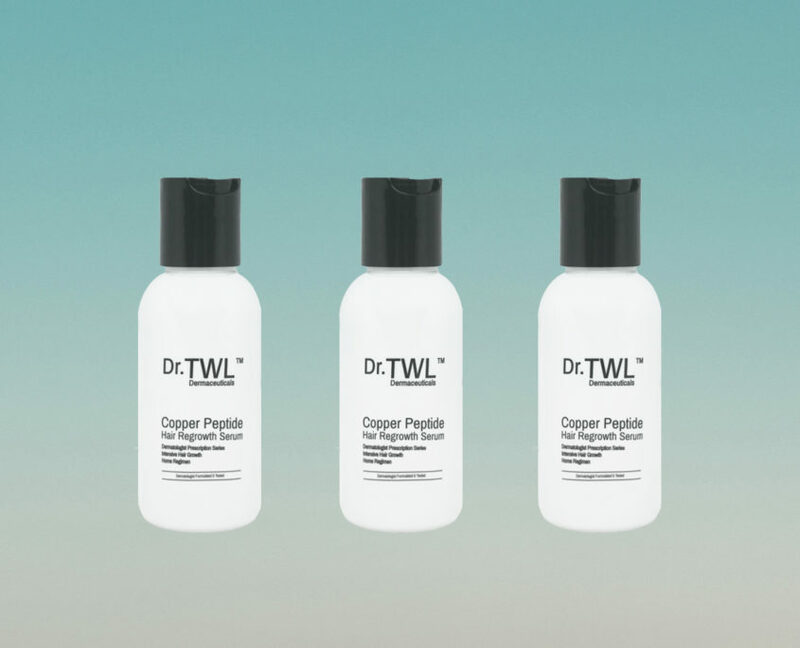 Copper peptides counter scalp damage by boosting collagen and elastin levels, increasing skin thickness. Originally prescribed in dermatologist Dr Teo Wan Lin’s clinic, this serum is now available at our online store for home regimen. It is clinically proven to have similar efficacy to that of 5% minoxidil, an over-the-counter treatment for hair loss and regrowth. Topical application of minoxidil increases blood flow to the scalp and normalizes hair follicles. However, patients may experience adverse reactions such as irritation or mild scalp dryness. In rarer cases, allergic contact dermatitis can develop, a form of eczema caused by an allergic reaction to a material when in contact with the skin. In minoxidil, the potential allergen is propylene glycol. Copper Peptide Hair Regrowth Serum stimulates growth without any toxicity or side effects of irritation. Apart from hair regrowth, it is also suitable for healthy hair types as the serum works to strengthen existing hair and thicken hair shafts. For intensive treatment, apply 5 to 10 drops on the whole scalp twice a daily. For maintenance, apply 3 drops on the whole scalp twice daily. © 2018 drtwlderma.com. All rights reserved. error: Copyright © drtwlderma.com 2017. All rights reserved.